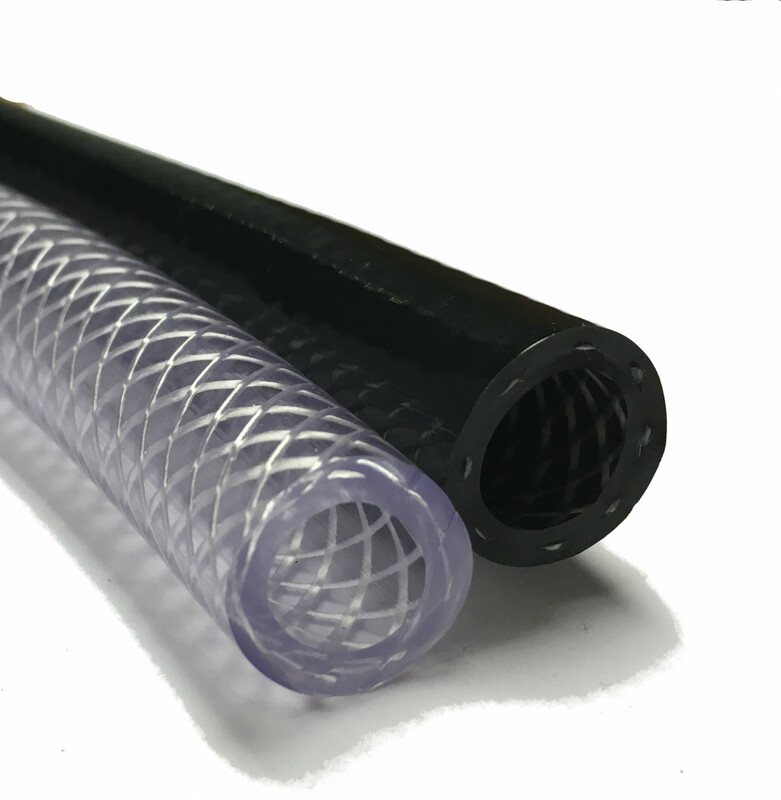 Resistant to a wide range of chemicals our reinforced, braided PVC hose is specifically designed to transport pressurised liquids, chemicals and gases. Manufactured from non-phthalate material which is free from substances of Very High Concern as described under REACH regulation. The material complies with the migration requirements of 2002/72/EC & its amendments. Operating Temperature: -20°C to +55°C. Occasional use up to +65°C. Cold bend temperature: -45°C. 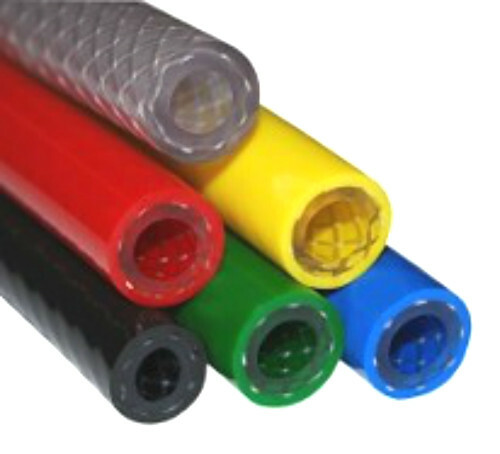 Chemical resistant and suitable for food and drink distribution, our reinforced braided PVC hose is designed to be low maintenance and capable of withstanding high pressures. Reinforced with polyester yarn. Manufactured from top-quality, crystal clear P.V.C compounds, this product is extremely flexible and comes coupled with a glass finish internal bore allowing for excellent flow rates. Resistant to a wide range of chemicals our reinforced, branded PVC hose is specifically designed to transport pressurised liquids, chemicals and gases, such as reducing agents, diluted acids and alkalis. Also resistant to waste components such as Urea and Uric Acid at an ambient temperature of 20°C. The flexible PVC is rated as Good with a 15% Sodium Hypochlorite solution (present in liquid bleach) at ambient temperature (20°C) but is rated Poor at 60°C, so temperature must be taken into account when using with such active ingredients. This is also the case for Hydrochloric Acid or Phosphoric Acid (found in some toilet cleaners). 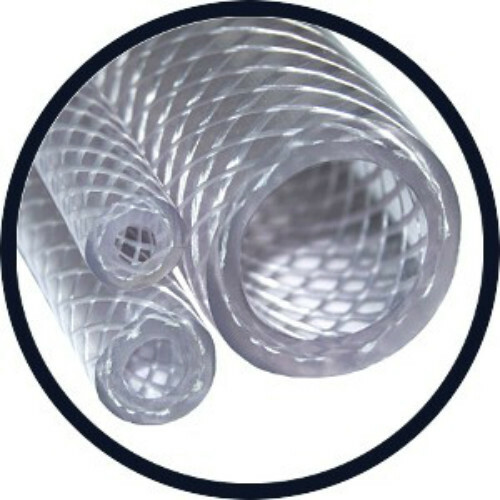 Our ply PVC constructed hose is specifically designed to withstand high working pressures. To ensure consistent quality and high standards of all our products. The working pressures are based on the short-term burst pressure at 20°C using a 4 to 1 safety factor. Any increases in temperature above 20°C will affect the short-term burst pressure quoted. The flexible nature of this product allows for an excellent flow rate, which reduces blockages and prevents sediment build up. However, within installations where 90° bends are required could lead to creasing of the hose which in turn could cause a blockage.